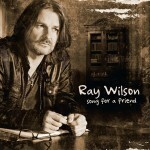 Share the post "Album review: RAY WILSON – Song For A Friend"
What a beauty of an album this is! Stiltskin frontman and ex-Genesis lead singer, Ray Wilson’s fifth solo album, “Song For A Friend” oozes quality and empathy – epitomizing heart-felt balladry throughout. Lots of touching minor chords provide perfect sonic translation of the not unusual themes of loss, friendship, life’s journey and how we deal with events along the way. This genre, of course, is a well-trodden path and can sometimes come across as pretentious, woe-is-me whinery. However, what is so warm and cosy about Wilson’s work on this album is the recurring message of hope and inspiration – don’t mope about life….roll with it, learn from it, embrace it. Honestly, this is a wonderful play-right-through collection of personal and profound songs which paint instantly accessible landscapes of one man’s voyage to spiritual fulfillment. I’m sure Wilson will say he’s not there yet but songs like opener “Old Book On A Shelf”, “Song For A Friend”, “How Long Is Too Long” (some lovely guitar phraseology on this one) and “Tried and Failed” attest to a man at peace with himself and the world around him. “Over My Dead Body” is, like all of these songs, extremely catchy and sticks like white on rice. If there is to be any criticism, it would be that the album closer, a cover of Pink Floyd’s “High Hopes”, certainly fits with the various themes of the album but left me thinking I would much rather have had six-plus minutes more of original Ray Wilson. Not that these songs need any better interpretation but if Cocker was still with us, he would surely be propelling one of these songs to worldwide recognition. This entry was posted in ALBUM REVIEWS, ALBUM REVIEWS (Mobile), All Posts and tagged album, Genesis, Ray Wilson, review, singer, Song For A Friend, songwriter, Stiltskin. Bookmark the permalink.